CHICAGO – Beneath every honorable warrior is a cold-hearted opportunist hell-bent on dominating his victimized prey at all costs. That’s a theory indelibly illustrated by Teinosuke Kinugasa’s revered 1953 classic, “Gate of Hell,” a melodrama populated by such frustrating characters that it nearly loses the viewer’s interest before its admittedly splendid finale, when the tale takes on grand dimensions of Greek tragedy. The real—and, regrettably, only—reason to seek out Criterion’s new release of this long-forgotten landmark is to marvel at the new digital master of a 2011 2K restoration that brought Kôhei Sugiyama’s vibrant color photography back to life. This was not only one of the first color pictures in Japanese cinema, but one of the first films to utilize color with the arresting vibrance of a truly painterly eye. The golds, reds and blues pop with such potency that they would’ve felt right at home in any Powell/Pressburger production. The opening shot of a scroll being unspooled before the camera sets both the rhythm and tone of the piece, as Kinugasa spends the first third of his 90-minute opus setting up the character of Moritoh (Kazuo Hasegawa), a fearless samurai whose unbending will works in his favor, until the film’s central conflict arises. As soon as Moritoh’s hawk-like gaze rests upon Lady Kesa (Machiko Kyô of “Rashômon” and “Floating Weeds”), a woman so beautiful she even causes the score to swoon with her mere appearance, the once level-headed man suddenly devolves into a tiresome, love-crazed maniac. Though Kesa is indeed married to a maddeningly stoic imperial guard, Wataru (Isao Yamagata), Moritoh won’t let it stand as an obstacle preventing him from achieving his desires. He’s even willing to kill Kesa just to ensure that she won’t leave his side (for an even more rewarding, gender-flipped meditation on diabolical sexual obsession, see Nagisa Oshima’s “In the Realm of the Senses,” available on a vastly superior Criterion disc). Gate of Hell was released on DVD on April 9th, 2013. Despite some memorable set-pieces, including an enormously influential yet all-too-fleeting horse race, Kinugasa’s film is at its strongest during a climactic 20-minute stretch where mounting dread and impending doom are signified by ominous currents of wind snaking through Kesa and Wataru’s house. A key act of violence is so poorly photographed and edited that it confuses more than it shocks, with the victim appearing asleep rather than stone cold dead. Yet this unfortunate moment leads to a denouement so satisfying that it redeems the flaws that permeated previous sequences. Hasegawa’s performance is exceedingly more complex than it appears to be on the surface, and in the film’s final moments, it ultimately proves to be heartbreaking. As a reflection of Japan’s post-WWII angst and despair, Kinugasa’s film still manages to haunt viewers decades after it won both the Palme d’Or and the Oscar for Best Foreign Film. “Gate of Hell” is presented in its 1.37:1 aspect ratio, and deserved a great deal more special features than new English subtitles and a typically fine essay from film historian Stephen Prince. Criterion has done such a marvelous job of introducing new generations to vital masterworks that could’ve easily fallen under their radar. It’s great to see “Gate of Hell” get any sort of release, but by slapping it on a disc devoid of extras, Criterion has done Kinugasa’s under-appreciated craftsmanship a gross disservice. 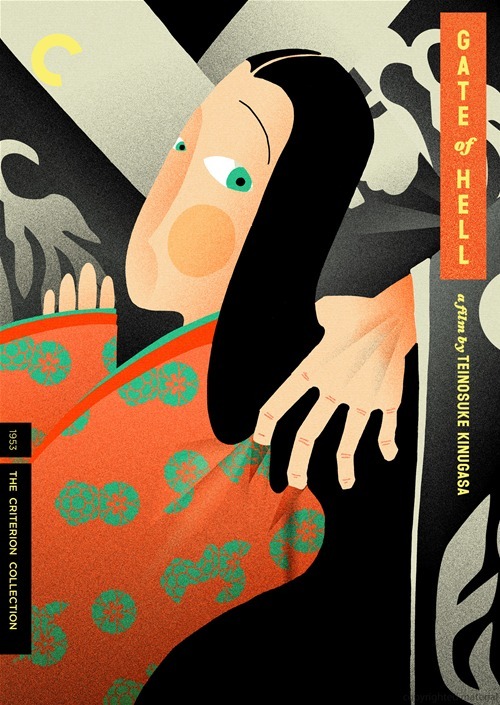 ‘Gate of Hell’ is released by The Criterion Collection and stars Kazuo Hasegawa, Machiko Kyô, Isao Yamagata, Yataro Kurokawa and Kôtarô Bandô. It was written by Teinosuke Kinugasa and Masaichi Nagata and directed by Teinosuke Kinugasa. It was released on April 9th, 2013. It is not rated.